During the month of October, in honor of the company's former employee and cancer survivor, Shelley DeYoung, along with all our friends and family that have fought the disease, Illiana is helping raise awareness about Breast cancer. During the month of October, $5 from every service call, $10 for every new Goldstar contract, and $50 from every equipment installation will be put in a special fund to help other women get the preventive care they need. Dan Krygsheld, left, and Kevin Frump, right, of Illiana Heating & Air Conditioning, present a $4,650 check to Mary Nicholson, MD, fellowship-trained, dedicated breast radiologist on staff at Community Hospital and regional director of breast imaging services for Community Healthcare System. Dan Krygsheld, right, and Kevin Frump, center, of Illiana Heating & Air Conditioning, present a $1,815 check to Mary Nicholson, MD, fellowship-trained, dedicated breast radiologist on staff at Community Hospital and regional director of breast imaging services for Community Healthcare System. On behalf of their fundraising efforts, St. John’s Illiana Heating and Air Conditioning general manager Kevin Frump and installation manager Dan Krygsheld have presented a $1,770 check to Mary Nicholson, MD, medical director of the Women’s Diagnostic Center in Munster. The funding is earmarked for patients who need diagnostic imaging. On behalf of their most recent effort, Dan Krygsheld and Kevin Frump of Illiana Heating & Air Conditioning present a $4,395 check to Dr. Mary Nicholson (left) at the Women’s Diagnostic Center in Munster. Pictured from left to right are Mary Nicholson, MD, fellowship-trained, dedicated breast radiologist on staff at Community Hospital and regional director of breast imaging services for Community Healthcare System, Kevin Frump, and Dan Krygsheld. On behalf of their most recent effort, Shelley DeYoung and Kevin Frump of Illiana Heating & Air Conditioning present a $4,295 check to Dr. Mary Nicholson (left) at the Women’s Diagnostic Center in Munster. Dr. David Robinson also contributed another check for $1,000 so more women would be able to receive diagnostic mammograms. Pictured from left to right are Mary Nicholson, MD, fellowship-trained, dedicated breast radiologist on staff at Community Hospital and regional director of breast imaging services for Community Healthcare System, David Robinson, MD, plastic surgeon, Shelley DeYoung and Kevin Frump. On behalf of their most recent effort, Shelley DeYoung and Kevin Frump of Illiana Heating & Air Conditioning present a $4,295 check to Dr. Mary Nicholson (seated) at the Women’s Diagnostic Center in Munster. Pictured from left to right are Mary Nicholson, MD, fellowship-trained, dedicated breast radiologist on staff at Community Hospital and regional director of breast imaging services for Community Healthcare System, Shelley DeYoung and Kevin Frump. On behalf of their most recent effort, Tom and his son Dan Krygsheld presented a $3,350 check to Dr. Mary Nicholson at the Women’s Diagnostic Center. Pictured from left to right are Dan Krygsheld, Mary Nicholson, M.D., fellowship-trained, dedicated breast radiologist on staff at Community Hospital and regional director of breast imaging services for Community Healthcare System, Shelley De Young and Tom Krygsheld. On behalf of their efforts, the Krygshelds recently presented a $3,000 check to Dr. Mary Nicholson at the Women’s Diagnostic Center. Pictured from left to right are Shelley De Young, Tom Krygsheld, Sue Krygsheld and Mary Nicholson, M.D., fellowship-trained, dedicated breast radiologist on staff at Community Hospital and regional director of breast imaging services for Community Healthcare System. MUNSTER – Women without adequate insurance, but in need of diagnostic imaging will get the care they need at the Women’s Diagnostic Center, thanks to the generosity of a local business and physician. Checks in the amount of $4,295 and $1,000 have been presented to Mary Nicholson, MD, medical director of the women’s center in Munster on behalf of Illiana Heating & Air Conditioning and Board-Certified Plastic Surgeon David Robinson, MD, respectively. “These generous donations will help supplement a grant we have received from the Indiana Breast Cancer Awareness Trust,” said Nicholson. “We’re working to help women believe the truth that early detected breast cancers can be treated successfully. We strive to ease our patients’ minds, alleviate their stress and fear, and replace it with confidence in care that’s close to home. This funding will enable us to serve many more with the care they need,” she said. Six years after treatment, St. John resident Shelley DeYoung credits her recovery, in part, on her healthcare team at Community Hospital, the Women’s Diagnostic Center and support from her employers – Illiana Heating and Air Conditioning. To ensure other area women will be able to access the same quality care as their customer service representative De Young, Tom, and his wife Sue Krygsheld of Illiana Heating and Air Conditioning, hold a fundraiser during October – Breast Cancer Awareness month. Proceeds from installs and service calls during the month go to an account set up through Community Hospital to help other local women – those without insurance and who otherwise couldn’t afford them - receive diagnostic imaging at the Women’s Diagnostic Center. When Dr. David Robinson, also a member of DeYoung’s healthcare team, heard about the donations, he wanted to help too. He raised $1,000 toward breast cancer awareness by running in the 2014 Chicago Marathon and his check was added to the fund. With this funding, diagnostic imaging has been made available to those in need – providing care to more than one woman positive for breast cancer. Breast cancer is a disease that can be diagnosed early through routine mammography. The Women’s Diagnostic Center of Community Hospital offers digital mammography with same day results. With advances such as same-day results and coordination between area physicians, women can generally begin treatment for breast cancer within 10 days of diagnosis – saving lives. MUNSTER – Good neighbors Tom and Sue Krygsheld believe in taking care of their own and paying it forward along the way. During the month of October, the Krygshelds held a fundraiser to honor their employee Shelley DeYoung, a breast cancer survivor. 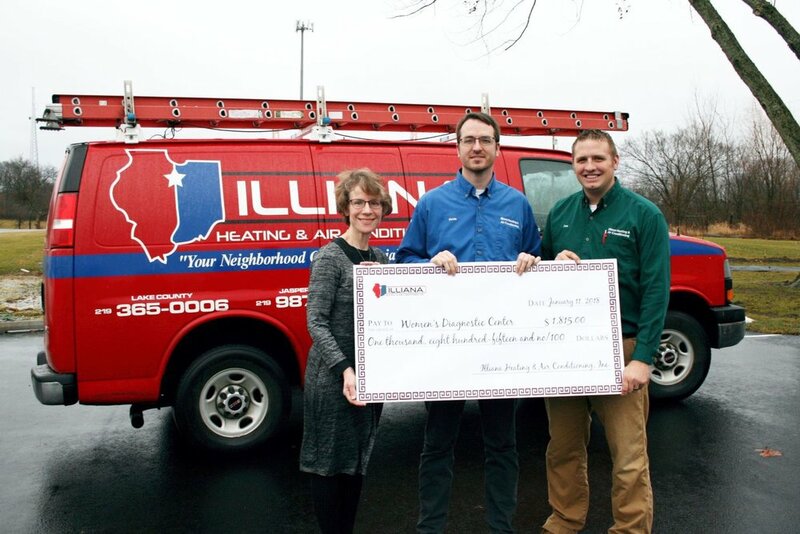 A portion of the proceeds from Illiana Heating & Air Conditioning’s service calls were set aside to help other women benefit from early detection of breast cancer. Five years after treatment, St. John resident DeYoung credits her recovery, in part, on her healthcare team at Community Hospital, the Women’s Diagnostic Center, and support from her employers – Illiana Heating and Air Conditioning. On behalf of their fundraising efforts, St. John’s Illiana Heating and Air Conditioning general manager Kevin Frump has presented a $4,295 check to Mary Nicholson, MD, medical director of the women’s center in Munster. The funding is earmarked for patients who don’t have insurance and need diagnostic imaging. “This generous donation will help supplement a grant we have received from the Indiana Breast Cancer Awareness Trust that covers approximately 50 screening mammograms,” said Nicholson. “We’re working to help women believe the truth that early detected breast cancers can be treated successfully. We strive to ease our patients’ minds, alleviate their stress and fear, and replace it with confidence in care that’s close to home. This funding will enable us to serve many more with the care they need,” she said. Conditioning held a fundraiser during October – Breast Cancer Awareness month. Proceeds from installs and service calls during the month went to an account set up through Community Hospital to help other local women – those without insurance and who otherwise couldn’t afford them - receive diagnostic imaging at the Women’s Diagnostic Center. In 2011 and 2012, the Krygshelds also provided donations to the Women’s Diagnostic Center as a result of their October fundraiser. Diagnostic imaging was made available to women with that funding and more than one has turned out to be positive for breast cancer – providing care where there wouldn’t have been an opportunity otherwise. For more information about Illiana Heating & Air Conditioning, Inc., call 219-365-0006 or visit www.illianaheating.net. Learn more about the Women’s Diagnostic Center and advances in women’s care at www.comhs.org.